The office staff and dr were very polite. My appointment was very brief so I did not have much interaction withthe doctor. I would still recommend her to others I believe. The office staff and dr were very polite. My appointment was very brief so I did not have much interaction with the doctor. I would still recommend her to others Ibelieve. Although I didn’t get to see her ( she comes on Wednesdays) a saw the other provider her assessment or something,but they are really good professional and vary welcoming also they answered all my Qs. Although I didn’t get to see her ( she comes on Wednesdays) a saw the other provider her assessment or something, but they are really good professional and vary welcoming alsothey answered all my Qs. 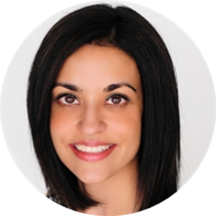 Karan K. Sra, M.D., is a native Texan, as she was born and raised here in Houston. She completed her undergraduate training at University of Texas where she graduated with honors. She attended medical school and completed her internship in internal medicine at the University of Texas Medical Branch at Galveston. Prior to starting residency, she was a fellow in clinical trials at the Department of Dermatology at the University of Texas Medical Branch at Galveston and Center for Clinical Studies in Houston under the supervision of Dr. Stephen Tyring M.D. She completed her dermatology residency at the University of Texas Medical Branch at Galveston and she is board certified by the American Board of Dermatology. Dr. Sra has published over 15 scientific manuscripts in medical journals and books in the last few years. She has received numerous academic awards including 2 scholarships from the National Institutes of Health. When Dr. Sra is not working, she enjoys traveling, practicing yoga, and running. Dr. Sra has published over 15 scientific manuscripts in medical journals and books in the last few years. She has received numerous academic awards including 2 scholarships from the National Institutes of Health. Besides the wait time, the visit was timely and quick. I actually saw the associate. As a senior citizen it was very important to have a thorough first time exam. I was very impressed with her knowledge and willingness to help me get rid of keratosis and did a few biopsiesof suspicious moles. Diane and her staff were concerned and caring.. the nurse that showed me to my room was very caring too . She made me feel comfortable and asked concerning questions. I highly recommend this office. Took them about 1hour and 50 minutes to see me but the doctor spent 5 minutes with me. She did figure out the source of my problem, but I felt rushed after waiting so long. When she finally saw me, sheasked me 3 sentences then prescribed me about 4-5 medications. I am not big on taking a lot of medicine at one time but in this case I was having horrible allergic reactions. Her prescriptions have helped. I will likely be back. Hopefully the wait time is not as long. I was later to other engagements as a result of this. Everything and everyone was wonderful! I was seen by Karan’s PA. Wonderful is an understatement. She took her time to explain everything and went over the procedures one by one. Highly recommend! I was actually a little early for my appointment and they took me in early. Everyone I encountered was very nice and friendly and helpful. I did not have to wait long for the doctor and she didn't waste any time.Felt comfortable with everyone. Making the appointment online was easy too. I was highly satisfied with my visit. I completed all my forms online before my visit so I was seen as soon as I checked in with the front desk. Dr. Sra saw me right away and explained everything in detail as needed. Dr. Sra is awesome. Very caring and professional. Super customer oriented and listens to my concerns, issues, etc. I wouldn't hesitate a second to recommend her to others. I loved Dr. Sra and her nurse and staff! She is knowledgeable, personable, and caring. So happy to have found a dermatologist I can stay with. Straight forward visit. Friendly staff. No complaints at all. She's fast and I think her diagnosis was accurate. What I didn't like is that she didn't give me options for the products she recommended, only suggestion were the ones they sell on the office. I saw Chelsea Barr, PA, she is AWESOME!! She is very knowledgeable and personable, very easy to talk with. I also had the pleasure of meeting with Christina. She helped me with my products and showed me hands on how touse them and how wonderful they felt. She is AWESOME too! Thank you ladies for your knowledge, comfort and time. WONDERFUL experience. I highly recommend. The front desk staff was helpful but not very friendly. Dr. Sra came in, looked me over then left very quickly. She seemed to be in a rush and did not show a concern for the patient unless I was to ask alot of questions. Dr. Sra was recommenced to me by a friend. She and her staff are friendly and know their business. Dr. Sra asks questions and gives the patient every opportunity to ask their own questions. She genuinely wants to help her patient. Dr. Sra is personable and realistic. She offers viable solutions for various issues. She is genuine and listens very well. I appreciate her friendly office staff as well. Dr Sra is great dermatologist. Any questions or concerns you may have she takes the time to answer them. Dr. Sra has always been prompt in seeing me once I am in an examining room. She has always been knowledgeable and efficient about treating me. I was seen quickly and treated efficiently. Very professional. The staff is very friendly and Dr. Karan was very communicative with me on my issues and gave me everything I needed! I would definitely recommend. Dr. Sra is awesome. She reallly cares about her patients. It's always a pleasure to see Dr Sra. I was very pleased with Dr. Sra and her staff. I found her to be professional, informative, and engaging relating to my issues. The members of her staff were friendly and helpful. I will happily recommend her to my friends and associates. This was my first appointment with Dr. Sra. I was pleased with her punctuality and willingness to discuss, in detail, her suggested treatment and what to expect. Great, she listened to me and addressed my problems. Very professional and caring! Staff and physician were very friendly and knowledgeable. She seemed very knowledgeable, just too quick during the appointment. She speaks too fast, which makes it challenging to understand especially whenever she mentions medical stuff. Expected better for the pricey charge. I don’t it’ll be worth it to return. Doctor Sra was very informative about my condition and along with her staff, was very professional. Highly recommend Dr.Sra for anyone needing a dermatolgist. Love her! She is always great!